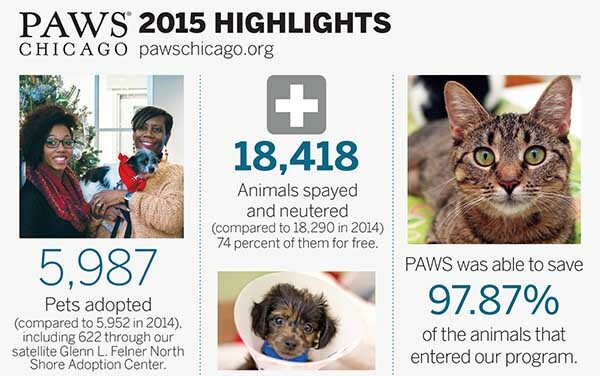 PAWS Chicago broke a number of records in 2015, including the numbers of adoptions, volunteer hours and spay/neuter surgeries. But it was also a year with significant new and life-threatening challenges for homeless animals. In early in 2015, Chicago faced the outbreak of Canine Influenza Virus (CIV). The H3N2 virus had never been seen before in the U.S. and is highly contagious. As a result, all of the dogs who may have been exposed must be isolated for up to 30 days to prevent spreading the disease. The ability to innovate in response to a changing environment is critical for all industries, but it is even more urgent when lives are on the line. Because of our Medical Center, the generous support of our donors and the ingenuity of our team, PAWS Chicago adapted operations, treatment and isolation protocols and animal housing, becoming the only animal rescue organization in Chicago equipped to take in and care for a large volume of CIV cases. Additionally, our innovative community engagement approach has expanded our capacity to save more lives by placing CIV-exposed dogs in trained foster homes during their lengthy isolation period, increasing the number of sick animals we can save. In 2015, PAWS Chicago treated more than 350 animals with CIV and has more than 50 still in quarantine and in foster homes. Had it not been for PAWS’ ability to care for these CIV animals, many of them would have been euthanized. And without generous public support, PAWS Chicago would not have been able to help CIV-exposed dogs while still maintaining our ongoing array of programs aimed at rescuing, rehabilitating, spaying/neutering and finding adopters for thousands of animals. These programs continue to have a positive impact, decreasing the number of dogs and cats euthanized each year in Chicago. In 2014, that number fell below 10,000 for the first time, and the positive trend looks to continue. In 2015, while final data is not yet available for all Chicago shelters, it appears the number will remain below this threshold. In 2015, the number of dogs and cats euthanized at Chicago Animal Care & Control (CACC), the city pound, fell to 4,452. In addition, the number of pets entering the facility dropped to 15,383. These figures represent progress, especially when compared to the stunning 42,561 homeless cats and dogs who were killed in Chicago in 1997. That year, PAWS Chicago was founded in an effort to bring to light this horrible epidemic of animals dying simply because they didn’t have homes. But these numbers also show how far we still have to go to become a No Kill city. Every day, we still see the faces of those dogs and cats that have been left behind, pleading to be rescued. These pets are often the elderly and sick who have been dumped at shelters, animals with the scars of past abuse and those that are never even given a chance. Please consider helping Chicago’s homeless animals by adopting, fostering or donating to PAWS. Our work is only possible because of the support of Chicago’s animal-loving community. Found new families for 5,987 homeless cats and dogs, including 622 through our new satellite Glenn L. Felner Adoption Center in Highland Park. Spayed and neutered 18,418 pets, 74 percent of them free of charge. Placed 2,841 animals in foster care, opening up space in our Medical Center. Provided 41,660 vaccinations, microchips and blood tests. Saved 97.87 percent of animals who entered our adoption program. Saw volunteers work 117,007 hours, equivalent to 56.3 full-time employees.